Imagine a field of sunflowers, bright yellows, oranges and greens, this was the inspiration for my next bride. Amy and I met last year, she is so sweet, she came with her girlfriend and her mom to my studio. I offer all my brides a 1 hour FREE consultation, which once I get going usually turns into 2-3 hours. You see I love "LOVE", I love to see people in love and I like to make things that express their love. I AM a true romantic. Amy loves sunflowers, and if I am not mistaken it also reminded her of back home down east. I think that was one of the things that I love most about her was she was so nice. I mean have you ever met someone from down east that wasn't nice honestly it is very hard but Amy was nice and very sweet. Amy wanted to somehow incorporate this in her wedding, I didn't actually have anything with a sunflower motif but was more than willing to do some research (code for shopping) to see what was out there. I told here there would be no charge if she didn't like that stamp I would keep searching and use it for something else. 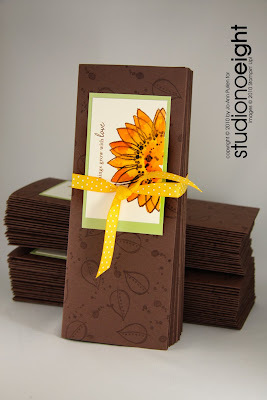 Trying to find a sunflower stamp is very difficult, and one large enough for what I need even harder. When I get an idea in my head sometimes it is hard to find the things that I need. I new I wanted to hand paint Amy's invitation, (88 to be exact) to me the sunflower is big and bold and strong so the colours also had to be. I first tried to find something online, there were lots of tiny ones and some very abstract but nothing exactly what I wanted. So I decided to head to our local store which actually gave me a few options and though I wasn't sold on it I did purchase one and headed home to do some magic. I already knew what colours I was going to use and as much as I can I love to use the re-inkers link watercolours. So I went home and got out my re-inkers, my aqua painter, and went to town. For this invitation as I mentioned I wanted it to be hand painted and I wanted texture so I used water colour paper. I did them two design one to fit in a number 10 business envelope and another that fit into a standard invitation. My objective was colour and lots of it. 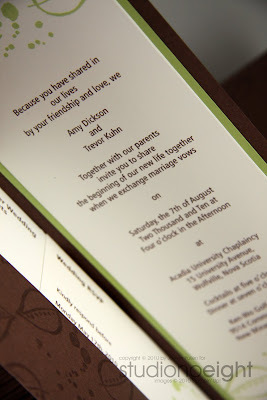 Here is the invitation that they picked which I absolutely fell in love with. Congratulations Amy and Trevor I look forward to hearing all about your wedding and can't wait to see some pictures! 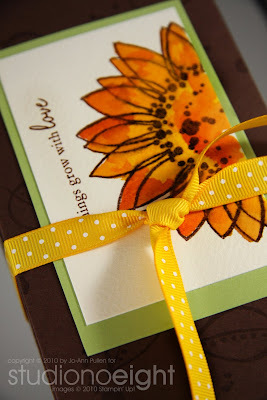 Close-up of the front flower the background was stamped with Versa Marker and a leaf that came with the stamp. 88 hand stamped and painted invitations bundled and ready to be shipped. 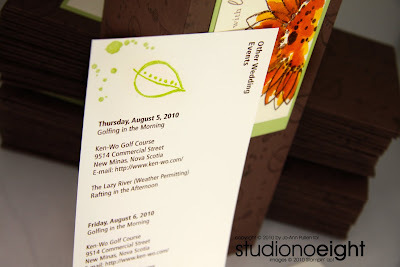 response card and other wedding events card, plus envelope. Another gorgeous invitation! I'm sure the couple and all the recipients loved them!